Tomás Morales, president of Cal State San Bernardino, has been named the recipient of the prestigious Alfredo G. de los Santos Distinguished Leadership in Higher Education Award from the American Association of Hispanics in Higher Education. Morales, who is in his second year of leading CSUSB, will receive the award on Saturday, March 8, during the association’s annual conference, which is being held this year in Costa Mesa. The award, which will also be shared with National Hispanic University Chancellor David López, is given to an outstanding administrator in the field of higher education who has demonstrated excellence in the profession. The award is named in honor of Alfredo G. de los Santos, who over a 40-year career in education served as a librarian, dean, president and vice chancellor at Maricopa County Community Colleges, one of the nation’s largest community college districts. “We are very proud that you will continue a prestigious line of dedicated champions of higher education who have received this award,” said AAHHE president Loui Olivas. Morales joined Cal State San Bernardino in 2012 and is the university’s fourth president since it opened its doors in 1965. Prior to coming to CSUSB, he had served as president of the College of Staten Island, The City University of New York (CUNY) beginning in 2007. He previously served as provost, vice president for academic affairs and vice president for student affairs at California State Polytechnic University, Pomona. Prior to that, Morales was vice president for student affairs and dean of students at The City College of New York/CUNY from 1994 to 2001. He is one of the few higher education administrators in the United States who has held senior administrative positions at the three largest public university systems in the nation: The California State University, The State University of New York and The City University of New York. 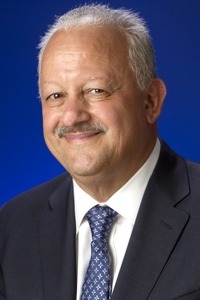 In addition to leading Cal State San Bernardino, Morales serves as the chair of the board of the American Association of State Colleges and Universities and as vice chair of the Governing Board of the Hispanic Association of Colleges and Universities, and as a member of the board of directors of the American Council on Education. He previously served on the Executive Committee of the Coalition of Urban and Metropolitan Universities, the American Council on Education’s Commission on Racial and Ethnic Equity, and the National Information and Communication Technology Literacy Policy Council. He holds a B.A. in history from the SUNY, New Paltz, and earned his M.S. and Ph.D. in educational administration and policy studies from SUNY, Albany.